Forbes 2017 Best Small Cities for Business rankings are out, with Sioux Falls, SD at the top. The business media outlet ranked Sioux Falls high for it’s low unemployment rate, low cost of living, high number of financial services jobs, and more. Ernst Capital is proud to call Sioux Falls home, and we’re glad those in other parts of our country continue to take notice of our strong, vibrant, and growing community. We’re pleased to announce that we closed fundraising for the Downtown VUE, LLC, raising $3,250,000 from investors across the Midwest. Mercy Medical Hospital & College and the Des Moines Area Community College downtown campus. Immediately to the south is the world headquarters of Principal Financial, currently undergoing a nearly $300 million renovation. The site is also near the riverfront, Wells Fargo Arena, Convention Hall & Hotel, and more. VUE is the third project that Ernst Capital has partnered with Hubbell Realty Company, a leading developer and property management firm based in West Des Moines, IA. Ernst Capital is pleased to announce that fundraising for the Dakotas Real Estate Income Fund IV has closed. Private investors throughout the Midwest committed $11,850,000 in capital for developments valued at over $47,000,000. In early July, we’re going to be distributing over $370,000 to Dakotas Fund IV investors, and plan to continue with monthly distributions going forward. Thank you to all who invested in or considered the Dakotas Fund IV. Park88 is a new development under construction in West Des Moines, IA. When complete, the project will feature 161 total units of apartments and townhomes. The first townhome units are anticipated to come online in the Fall of 2017 with the 4-story apartment building available in 2018. 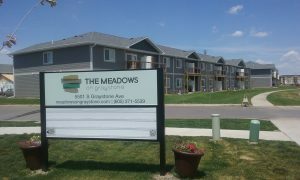 Meadows on Graystone is a new development under construction in southeastern Sioux Falls, SD, with new units coming online each month. The project will consist of 200 townhome-style apartments (15 total buildings). The first seven buildings have been complete to-date with leasing ahead of initial forecasts. 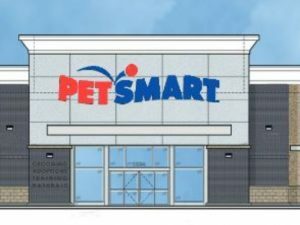 DawleySmart Retail is an 18,000 sf commercial retail development for a new PetSmart retail store in the Dawley Farm Village in eastern Sioux Falls, SD. Construction is complete and store opening planned for later this summer. 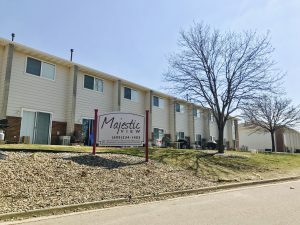 Majestic View is a 40-unit townhome-style apartment complex located in central Sioux Falls, SD. After purchasing the property, we have replaced all windows and patio doors. This summer, we are painting the buildings, performing asphalt repairs, and installing privacy fences. Hubbell Realty Company, our development and management partner in Des Moines, IA, was awarded seven Pinnacle of Excellence awards from the Greater Iowa Apartment Association, including Management Company of the Year. Hubbell Realty Company is the real estate leader in Des Moines, providing a full range of services including commercial construction, development services, property management, brokerage, and home building. Ernst Capital Group has partnered with Hubbell for construction, development, and property management services on Legacy Landing and 5Fifty5 Townhomes. We’re proud to call Sioux Falls home, as the city is home for our company as well as many of our investment holdings. 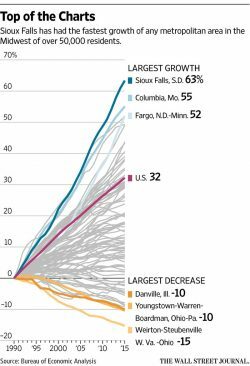 The Wall Street Journal also took note of Sioux Falls’ growth, with a story today that features our city’s trajectory as the fastest growing metro area in the Midwest of over 50,000 residents. Writer Shibani Mahtani goes back into our history of economic development, noting the trajectory changes in financial services starting in the 1980s and the health-care explosion that has occurred over the past 20 years with advances by Sanford and Avera Health. The employment and services that have followed these employers has fostered Sioux Falls 63% population growth since 1990, as noted in the Bureau of Economic Analysis data the WSJ cites. We’re pretty excited about Sioux Falls and its’ future, we’re happy that the Wall Street Journal is also taking notice. Jodi Schwan, the longtime business journalist and former city Chief of Staff has started a new venture and business news source: SiouxFalls.Business. This week, the SiouxFalls.Business website featured The Commons as a new approach to multi-family living in Sioux Falls. The Commons, along with 5Fifty5, are apartment communities owned by the Signature Real Estate Income Fund, LLC. The article discusses the multiple options for prospective residents that can be found at The Commons. Within the one community, residents can choose from The Flats, consisting of two-story townhome apartments with private entrances, as well as three and four-story apartments and townhomes with attached garages. This will allow The Commons to attract residents looking for different options and amenities all within one cohesive community. Click here for more information on leasing one of the new units at The Commons, set to open this summer. Or, you can read more about The Commons from Jodi at her new site, SiouxFalls.Business. Ernst Capital is pleased to announce that fundraising for the Signature Real Estate Income Fund has closed. Private Investors throughout the Midwest committed over $8,000,000 in capital for developments valued at over $42,000,000. In the coming weeks, we’re going to be distributing over $250,000 to Signature Fund investors, and plan to continue with monthly distributions going forward. Thank you to all who invested in or considered the Signature Fund. We’re excited for the future of The Commons and 5Fifty5. 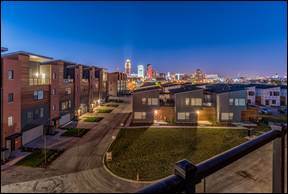 5Fifty5 is a 47-unit townhome project in downtown Des Moines, Iowa developed and constructed in partnership with Hubbell Realty Company. Construction is complete on the first four buildings with the last 6 buildings coming online in early 2017. The Commons is a 295-unit housing complex in Sioux Falls which will consist of townhomes and apartments developed and constructed in partnership with Signature Companies. Construction has started on site work and framing of the 1st units. In the spring of 2017, Signature Construction will begin work on the clubhouse and community building, anticipating a partial opening in early 2017. Congratulations to Lloyd Companies, our partners in Property Management and Development, as Lloyd Property Management was named the Top Property Management Firm at the SD Multi-Housing Association‘s annual Walk of Stars event held on December 6 in downtown Sioux Falls. property management, real estate, construction, and development company. Lloyd manages over 4,500 units of multi-family housing, including more than 2,500 units in projects syndicated by Ernst Capital Group. Lloyd Companies announced that they have begun to work on a new PetSmart store at Dawley Farm Village, as reported by the Argus Leader. We are excited about this new prototype store, as it will be located adjacent to the Burlington store and near Highway 11 Retail. Both properties are owned by the Dakotas Real Estate Income Fund II. Construction on the new store is slated to begin within the next few weeks, with opening planned for next summer.